The restaurant is located in the walkway/shopping area between the Luxor and the Mandalay Bay hotels (called Mandalay Place). If you're in either hotel, or THEHotel, you can get to it easily without setting a foot outside. Any other hotel is easy enough, either through the tram, or you can walk if you can brave the heat or it's winter. There's a bar the length of the restaurant (the place is rather thin) with a good amount of seating, and TVs to watch which I assume mostly have sports on. There are also tables and booths. The beer selection really surprised me, with a good tap selection and an awesome bottle selection. I'm not sure how many people actually decided to go for the craft beer though, so there may be lower turnover. I did see a Pumpkin Ale in a bottle (this was in July), so I'm guessing a lot of beer sits in the fridge for a while. The burgers are really good, as it's their specialty. Good service and friendly. The prices are a little higher but it is Vegas, so it's expected. Overall, a place to hit if you're on the south end of the Strip. 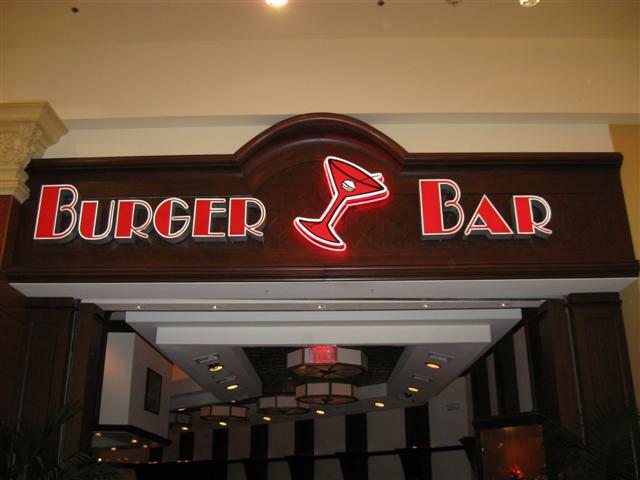 The Burger Bar is an upscale burger joint. The interior gives homage to Jersey diners with plenty of shiny metallic surfaces. Being Vegas, the server's uniforms are tight and tiny. The overall vibe is busy, but not too hectic. It's still an enjoyable spot to sit and have a beer. Burger Bar has great beer choices too. They have about forty draft choices, a whole lot of bottles and even some vintage choices. Belgian ales are featured. This place should have something you'll enjoy. Burger & the Abyss (on tap). That's enough to make me happy. I judge the beer prices as moderate. The Abyss was $7.00, and Fat Tire was $6.00. (a bottle of Dos Equis @ the Hard Rock was $6.00) Vegas is a weird place beer-wise - it's free, or it's 6 bucks. In the Mandalay Bay, too bad that they can't get the beers this place has in the casino. A large number of taps. Feel is kind of nouveau retro California, upscale as is Mandalay Bay. The burger choices are the real reason to go here though, multiple choices of meat, bread, toppings, etc. The Chocolate Burger dessert is a must try. Not a good place to just go hang out and drink. This is small restaurant in the walkway between the Mandalay Bay and Luxor. This automatically makes them expensive. The place is small and popular. If you arrive at the wrong time, be prepared to wait. There was a person who walked up to the hostess stand and had reservations, so I would highly recommend checking into this. They have the popular Kobe beef burger, and it's worth the $17 admission. They also have this burger with truffles for $60 is you just hit it big. They have a decent beer selection, heavy on the Belgium's. Did I mention they are expensive? This was a fun place to eat and have a brew; Recommended! Very Gourmet Burger Bar. You can even order your slider made from Kobe Beef!!! Multiple options on condiments including cheeses, jalapeÃ±os, multiple mushrooms, ham and bacon. If you LOVE burgers & Beer! This place is a MUST. Though not exactly in-expensive. You can walk through multiple hotels to get here between the Mandalay Bay and the Luxor without stepping outside. When they closed I got a bottle of Leffe Blonde to walk back to my hotel. More than one person asked me what I was drinking. Kinda cool!